Considering outsourcing your IT department, read this. Without an IT background, even the smallest tech problem can derail your business and cut into your bottom line. However, investing in a full-time IT staff is an entirely different story. While even one professional can maintain the technological aspects of a business, this is another employee you need to pay salary, Social Security provide benefits too. As your company grows, you can't afford to not take care of your technology, yet you may not be able to afford the professional capable of doing exactly this. So what should you do? Perhaps it is time to consider outsourcing your IT department. When you add it all up, your company may be able to save tens of thousands of dollars annually (if not into the hundred thousand dollar threshold). When you take advantage of IT outsourcing, you don't have a salary, Social Security or benefits to pay into. This is a substantial annual savings. Additionally, you won't need to pay for as much internal hardware, you can avoid the datacenter and you won't need as much square footage to house the IT department. Essentially, IT outsourcing cuts down on your expenses across the board. If something goes wrong in your current configuration, you or one of your employees is stuck attempting to troubleshoot the situation. Without an IT background, it will take far longer to troubleshoot than it should. From why the computer won't detect the printer to network outages, sometimes the seemingly simplest issue can take hours to correct, while larger problems can take days to fix. All of this is a drain on productivity. The time you or an employee spends troubleshooting a tech situation is time away from their actual work. With an increase in productivity you'll finish work faster. Data backups is important. If you are a small business owner, you may not have the best backup technology in place. Perhaps you save everything to a thumb drive while printing off a hard copy. This might be better than back when companies relied on tape drives to backup everything, but it leaves you susceptible. By outsourcing your IT department a cloud service is usually integrated into your company. This provides a more automatic backup feature that helps both you and the outsourced IT service provider to recover damaged and lost files. With the improved backup system you'll have peace of mind knowing important files can be restored should the data ever go missing. From downloading and installing the update to restarting the computer, not being able to use your computer for even a few minutes is frustrating. When this happens for the entire office, it sets everyone back. The outsourced IT provide can update your software during off hours so you won't miss work. Depending on your business, its size and the amount you depend on the technology, you may still need an IT professional on hand to assist with real-time issues. However, for the vast majority of small and medium sized businesses, IT outsourcing can prove financial beneficial while still giving you the services you need to maintain the technological aspect of your business. 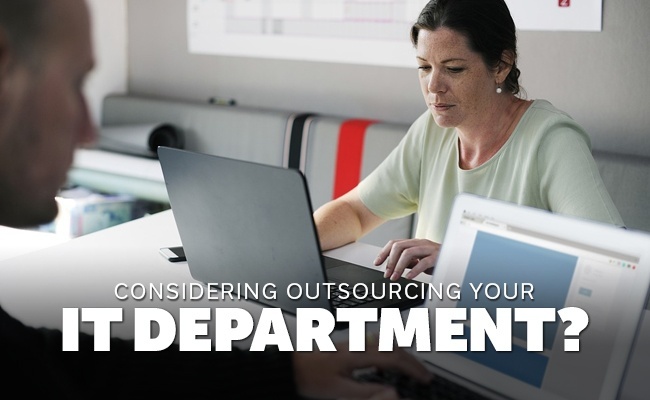 If you assumed you couldn't afford to take care of your IT department without a professional, IT outsourcing may be the best option for you.